(Above) Pracahaya works with AtlanticThai in Bangkok on database applications being developed for our worldwide websites reaching millions of internet users everyday from Muang Thong Thani in Bangkok. We are looking for talent in worldwide. Enquiries are welcome from interested parties. Graphic designers with web experience. PHP, Flash and HTML programmers. Experts in Java script and CSS design techniques. We have a number of full time contracts for staff working from our Muang Thong Thani offices in Bangkok. If you are interested, simply send an e-mail enquiry. We are also interested in hearing from contractors worldwide in any of the above areas. Since we are a Bangkok based company, we would be particularly interested in applications from people in the Bangkok area or Thailand. 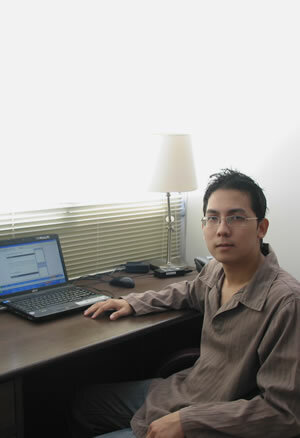 AtlanticThai is a small but growing company with 10 people working from our offices outside Bangkok. The focus of work right now is the development of internet applications and widgets to operate within database driven websites worldwide such as social networking, news and entertainment websites. Our company generates revenue through a per head royalty on the use of these applications or a package of applications. hence the growing importance of good design providing the user with a richer and more enjoyable experience. All enquiries will be treated in the strictest confidence and will be replied to within 24 hours.